Turn your bedroom into a haven with the Porter Dresser from the Porter Bedroom Collection by Ashley Furniture. This dresser features a warm, classic look with a rich burnished deep brown finish, decorative framed details, and stylish turned bun feet that all work to create a timeless feel. The dark bronze hardware perfectly complements the warm look of the dresser and makes the dresser feel inviting with a cozy, lived-in patina. The top drawers have felt-lined drawer bottoms while the other drawers feature cedar drawer bottoms. 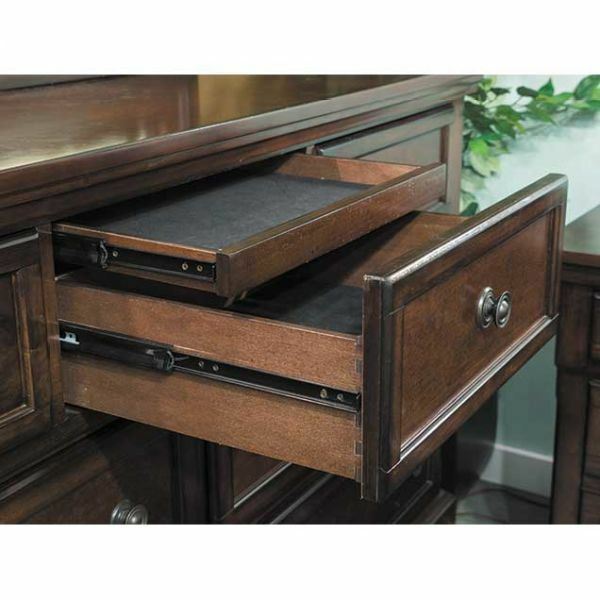 The center top drawer features a hidden drawer that is perfect for storing jewelry. Hidden storage in top center drawer.